The most photographed view of Queenstown is the one from the top of the gondola (reputed to be the steepest lift in the Southern Hemisphere), looking down on the town and Lake Wakatipu, with the saw-tooth Remarkables Mountains providing the abrupt horizon. 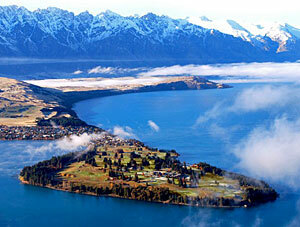 If you simply put ‘Queenstown’ in Google Images, you’ll see that half the search results show this same view. Well, the triangular peninsula in centre shot is Queenstown Golf Club, and that should tell you all you need to know about the splendour of its location. Queenstown Golf Club was first formed in 1927, with the original layout located a few miles away in Frankton, where there's currently a 9-hole course (called Frankton) and a covered driving range. It was not until 1973 that the club moved to its current home, the Kelvin Heights golf course, situated on the peninsula next to the rather affluent neighbourhood of the same name. The Hensman and Grant families designed the new course, with advice from Commander John Harris (who had just completed work on Wairakei International at that time). At 6,674yds (6,103m) off the back tees, Kelvin Heights is not long by modern-day standards, and considering how it is surrounded on all sides by water, it is perhaps surprising that the lake only really comes into play on one hole – but what a hole it is. The 5th curves majestically round to the left, with Lake Wakatipu looming, waiting to swallow any hook or pull off the tee. Photos of this hole often make it look rather flat, but up close and in person, the visitor will find it is actually contoured rather beautifully. 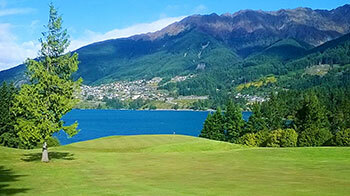 The course currently hosts an event on the Australian PGA Legends Tour, the Club Car Queenstown Legends Pro-Am. This was my favorite course in Queenstown and easily one of the most scenic I have ever played. The course itself is very good with some very good holes and with a very affordable green fee it represents excellent value for money. The 5th is a standout with its proximity to the lake, be sure to get a photo looking back down the fairway from this green. A parklands course but not a lot of trees so a nice mix of narrow and wide fairways. I played stunning Kelvin Heights on a driving/golf trip to NZ (highly recommended !) several years ago, so can't comment on current condition. However it lives the longest in my memory. I played on a lovely sunny day, The Remarkables looking close enough to touch, and had a tremendously fun game of golf. The course was quiet, so I was free to take plenty of photos and enjoy the clear air and sporting golf. There was plenty of variety, but for me the picturesque lake front holes with risk reward lines of play are the most memorable. There aren't many places where you can paraglide in the morning to check out the course from above, then play in the afternoon as I did! Friendly KH would be the first course I return to when I make it back to New Zealand. When I first played golf in queenstown this was far and away the best course around. It has been eclipsed by so many big budget foreign owners building new modern resorts. That said it still is a great course with superb iconic views. It remains in great condition and plays different every day due to wind. Well worth a visit if you're in the area. There’s not really too much to add to my review of 17 Feb 2011 (see below). This is a solid, enjoyable and extremely scenic course, and a reasonable test too, especially if the wind gets up. The course was looking good on the day I saw it – they are opting for some cleaner lines than on my previous visit, and new greenkeeper Ian Douglas (formerly of Millbrook and The Hills) has sorted out some drainage issues and neatened up some of the bunkers (again, going for the cleaner lines). Greens were not too speedy, but given they are reasonably contoured, one could argue that the more sedate pace is called for. I think I was wrong about a couple of things in 2011. My second round again made me suspect that the routing wasn’t optimal, especially when having hit straight and solid drives on all four par-5’s, I could actually only see the flag on one of them for the second shot. You’d have to have a different wind, or be quite a gorilla, for it to be otherwise, me thinks. Trying to hit par 5’s in two is, for me, one of the most enjoyable aspects of any round, and the three blind shots killed the fun somewhat. On the other hand, I think I was also totally wrong when I talked about narrow tree lined fairways. It’s funny how poorly our memories serve us sometimes. Whilst there’s not exactly an abundance of playing options around, there’s actually plenty of space, and plenty of scope for heroic recoveries. I think in my mind, I’d actually focused on the 6th as a particularly suffocating tee shot, and indeed, there wasn’t a huge gap. But this time round, I realised that the trees actually create choice on this hole (not something that encroaching trees are renowned for). You can take 3-wood or hybrid, and simply hit straight down the middle, but there is a much more bold option available. Hit driver with the right amount of fade, and you could catch a turbo boost off the highly cambered fairway, and possibly even get close to the green. Without the tight tee shot, I’m certain people would pull driver every time, and the exhilaration of pulling off the risky option just wouldn’t be there. Queenstown has its flaws as many have mentionned on many review sites but these are far than outweighed by the absolutely STUNNING views and slightly quirky shots you learn to play on one or two of the holes. This is not a championship quality course but it is in great condition and will be one that you remember and one that you will find yourself recounting when you have any discussions on your favourite rounds of golf from around the world. Don't miss out. I think any review of Queenstown Golf Club has to take into account that it was opened in 1973. At that time, Queenstown (the town itself) was completely different, the tourism industry was in its infancy here - commercial bungy jumping was still a twinkle in AJ Hackett’s eye. So to compare the golf course with anything else in the area except Arrowtown would be ludicrous. There was no well-paid, big name architect who put it all together, unlike its more illustrious new neighbours. Before I played here, the opinions I’d heard were pretty much of one voice – great scenery, but the course is flawed; “too many blind shots”, they’d all say. I actually thought the majority of the blind tee shots were perfectly acceptable, with no nasty surprises over the brow of the hill. The ones I think I (and most other people would) struggle with are the blind second shots into par 5’s, of which there’s two here. And if you’re going to get into a game of architectural quibbling, there are other things to set your sights on, like the proliferation of tightly tree-lined tee shots (making the holes too prescriptive), the gimmicky short 10th, the steeply uphill 167 metre 7th (i.e. I needed a 4-iron to a seriously elevated green), and all the pines blocking the stupendous view of the lake. Without having thought about it too deeply, I’d have to wonder whether a lot of these issues are related to decisions made about routing. But there’s a reason why I prefaced these quibbles in the way I did – it’s a club course from the 70’s, not designed by ‘experts’, what more can one expect? If you asked me whether I enjoyed the course, I’d not hesitate in saying “absolutely” (even though I played it in the midst of a 5-club wind). There are five or six very strong holes, in particular the show stopping 5th. The contours of the land are very conducive to good golfing terrain, and of course, the views (when you get them) are incredible. It’s a wonderful corner of the world to be playing golf in, full stop.